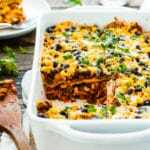 A gluten-free ground turkey Mexican lasagna recipe made with corn tortillas and full of spices, bell peppers, onions, black beans, and cheese. It is a super easy, kid-friendly, and healthy ground turkey recipe! In a large skillet over medium heat add oil, bell pepper, jalapeno, and onion. Saute for 5-7 minutes, or until almost cooked through. Add turkey to skillet and continue cooking for 6-8 minutes. Keep heat on medium and add crushed tomatoes. Let simmer on low for 5 minutes while fixing spice mix. Combine spice mix ingredients in a small bowl. Sprinkle into the skillet, stir, and let simmer for another 5 minutes. Spray a 9 x 13-inch baking dish with non-stick cooking spray. Start layering the Mexican lasagna with ⅓ of the turkey meat mixture. Next, layer 6 tortillas, ⅓ turkey mixture, ½ can of corn, ½ can of beans, and 1 cup of shredded cheese. Repeat with remaining tortillas, turkey, corn, beans and cheese. Place aluminum foil over baking dish and bake in preheated oven for 30 minutes. Remove aluminum foil and continue cooking in the oven for 5 minutes. Let sit for at least 10 minutes before serving. Enjoy! See this recipe in Meal Plan #7. Make sure you use corn tortillas, not flour tortillas. Adjust the jalapeno and cayenne pepper to increase or decrease the spice level in this recipe.